I finished my Asymmetry samples. I learned so much thru this exercise. 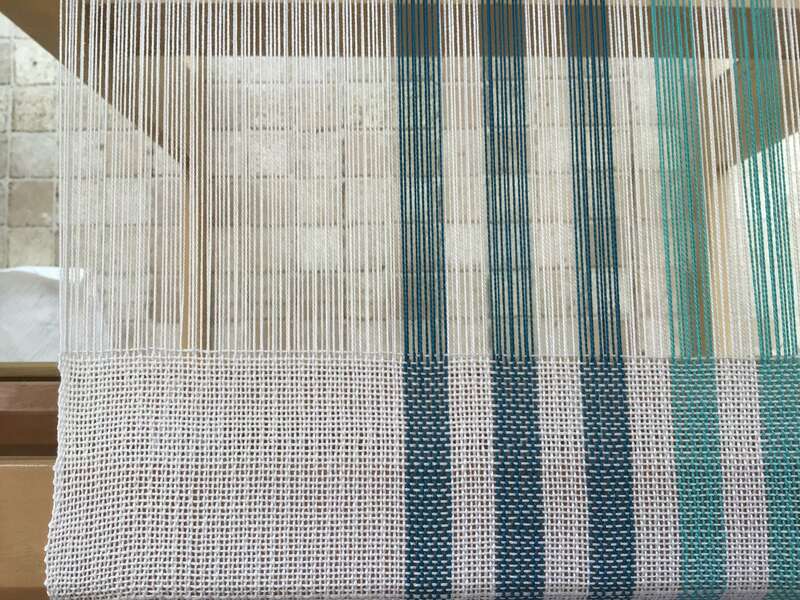 I really made a dog’s breakfast when entering the draft into my weaving software; I was attempting double width cloth for the first time and got so caught up in making it work and keeping in mind Fibonacci I completely lost sight of the parameters of the draft. Oh well, I did do double width even though I ended up with dish cloths rather than dish towels. 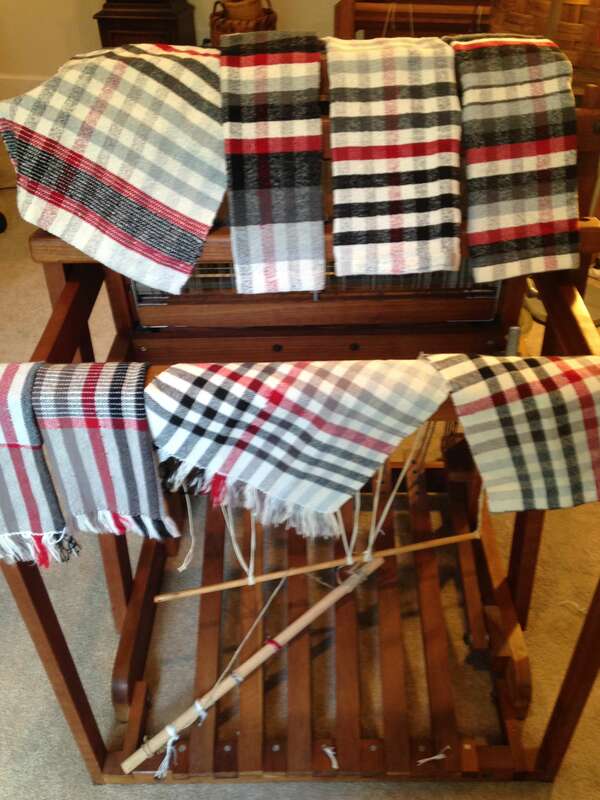 the top row have been washed and hemmed, the bottom row is straight off the loom and zig zag along hem edges. This reply was modified 7 months, 2 weeks ago by carol1855wlr. Your colors are so happy! I thank the person who told me to double the red threads of 8/2 while using the Boucle in the weft with the other colors… it worked and something new was learned on how to mix threads. All of these weave sessions are amazing. 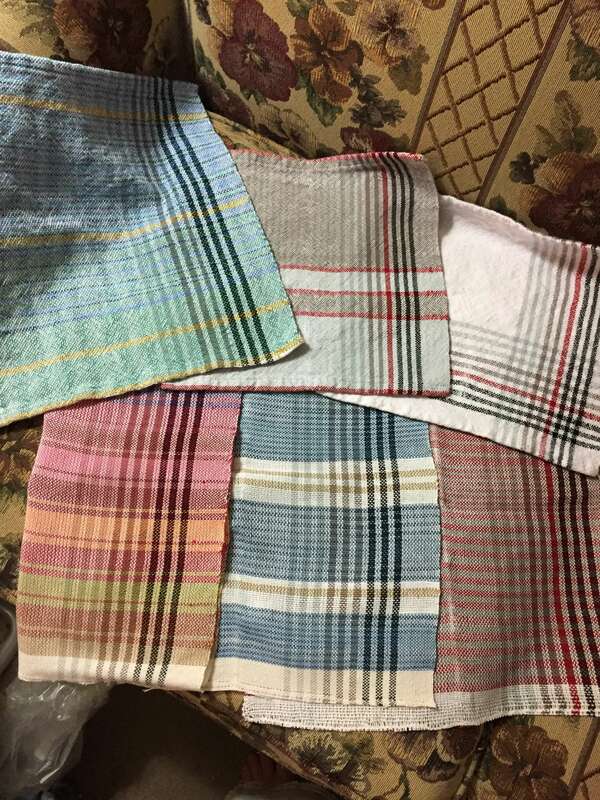 Fuzzy photo, and the EPI were changed in these tea towels from 18 epi to 12 epi. enjoyed it all. Thank you. I’ve had a look at the blog and it was very helpful. For now I’m going to persevere and just weave as near to square as I can. Then I’ll sley again using cams instead of inches! This is a good blog to to follow. I personally follow around 15 weaving blogs, to see what trends are around the world. A wealth of information out there. 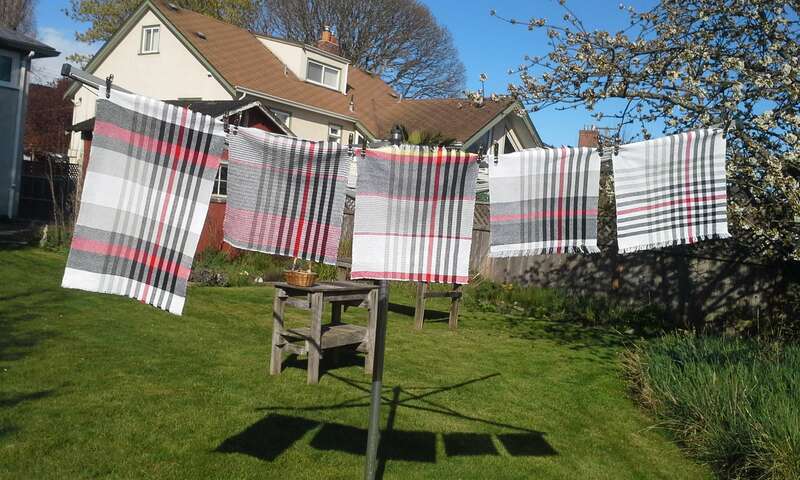 Before you re sley, try a sample with 2/16 cotton, the cloth will be finer but the warp stripes will be more prominent. I’ve got my first project all on the loom and the first one woven. 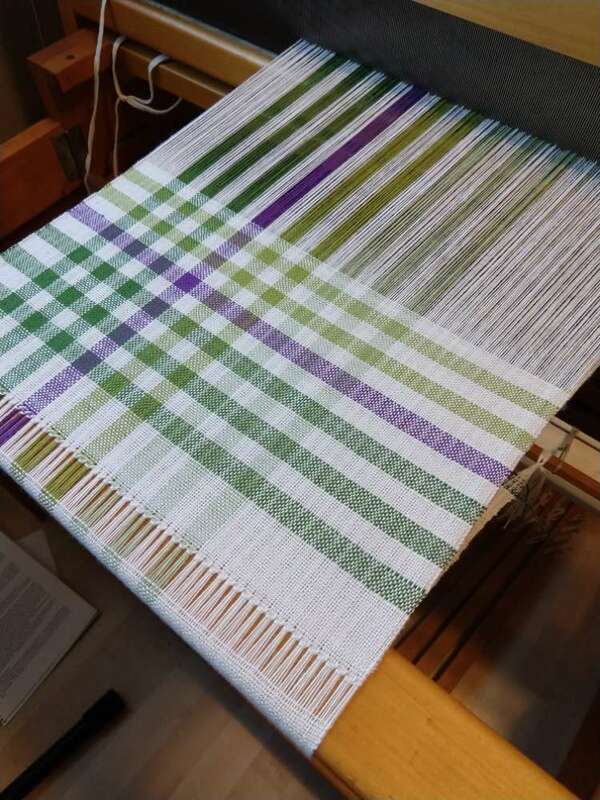 It’s been a real comedy of errors, first I’m trying to learn WeaveIt Pro and with my narrow loom I was attempting a double weave cloth. 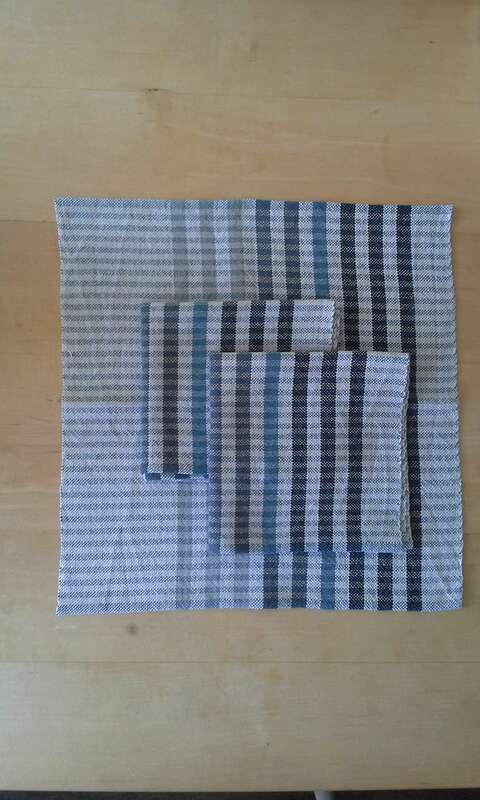 Well I made big mistakes in entering the project information and what I hoped would been dish towel sized samples have turned into dish cloth size projects. My fault, all my fault, LOL. You would have thought I would have double checked the math, or maybe used some basic common sense, but no. Well this size will make great samples on which to try everything I want to try design and color wise. I’ll also have plenty of room to open up the settt without too much effort (she say’s optimistically). Anyway having fun! Pictures to follow when I have several finished. Ginette, Thank You! That sounds like a great idea and I’ll give it a try. Hi Carol, I’ve forgotten to lash a few times…When I neared the end of the warp and was able to get in there, I lashed it to prevent the rod from bending and continued on weaving. Finally finished tieing on the warp to the back beam. All went fairly smoothly, a miracle as it’s only my second time trying back to front. Got everything wound on and ready to thread the heddles and found a broken thread. RATS! This is my first ever broken thread. I’m sure I handled it wrong as I tied the two ends together with an overhand knot, I don’t know the weaver’s knot and I’ll repair it when I get to that section. All ready to go and sit down and I remembered I forgot to lash together the apron rod and warp rod. Guess that means I’ll be having problems with tension down the line. DOUBLE RATS! Oh well, live and learn. Nothing like a mistake to keep you from repeating it in the future! Hope to get to threading heddles on Friday or early next week. I’m excited to get to weaving as I love this sample! I’ve seen so many gorgeous items posted here! Time for a break! Thanks Kathleen, I did just that. Not sure why it didn’t occur to me to do some math and figure out it would be that easy on my own. 🙂 I need to invest in another reed, soon. oh, looks great. Given me an idea to use my RH loom as well to revisit this project. Love them, they look fantastic! I have finished my asymmetrical sample #1. I was interested in trying 18, 16 and 12 epi. One piece at 12 epi looked good but I don’t have any bouccle so used misc. yarns I have. I changed the red to a blue stripe. I finished with 3 napkins at 16 epi. with a 4/4 stripe. I carried the 2 yarns on one side and it creates 2 different edges. I also liked trying variations of Fibonacci stripes. It was really helpful to look back and make decisions. I haven’t a photo for the 12 epi samples. I feel awed by the creativity of people!! Everyone does such beautiful work within variations on a theme.